When the Rose Bowl kicks off tomorrow, the Oregon Ducks will be 8.5-point favorites over the undefeated Florida State Seminoles. Oregon has been favored in every game this season, but the underdog role is a first for Florida State. In fact, the last game Florida State was the underdog in was September 24th, 2011, when the then 2-1 Seminoles faced off against Tajh Boyd and the Clemson Tigers. Since then, according to Garry Smiths, Florida State has been favored in every game. But unless something drastic happens between now and kickoff to change the spread in favor of the Seminoles, the Ducks will end FSU’s favored streak one short of 50. The Ducks are used to being the favorite according to Vegas, even if the rest of the country remains uncertain. Their first big test of the year was against Michigan State when Oregon entered the game as 13-point favorites. This was a proving game for Oregon, they needed to show the nation they could beat physical teams and their 45-26 win did just that. The next physical test was against Stanford, who had beat the Ducks the previous two match-ups. 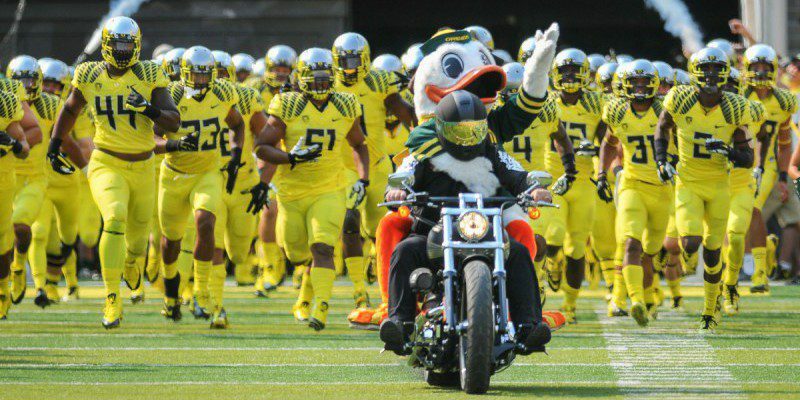 Oregon entered as 7-point favorites, but silenced doubters once again by winning 45-16. Lastly, in their rematch against Arizona for the Pac-12 championship, with everything on the line the Ducks won 51-13 and easily covered the 13-point spread. 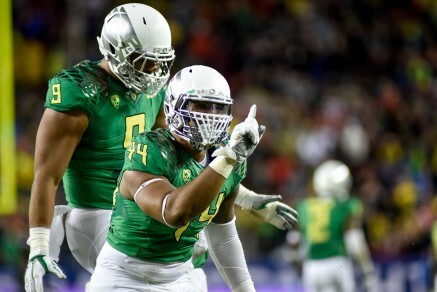 DeForest Buckner and Erik Armstead lead a surging Duck defense into the Rose Bowl. One final tidbit, Florida State has covered the spread only three times this year, while Oregon has covered in all but three games this season (Wyoming, Washington State, and Arizona in October). Since the Ducks got healthy on the offensive line, the Ducks are undefeated on the field and against the spread. The Ducks have the best player in the country and are arguably the hottest team in the country as well, two factors that bode well for Oregon in tomorrows game. Oregon has likely already ended Florida State’s favored streak, but if the Ducks can keep their near-perfect play going, they could hand Jameis Winston his first loss and end Florida State’s 29-game win streak in the process.